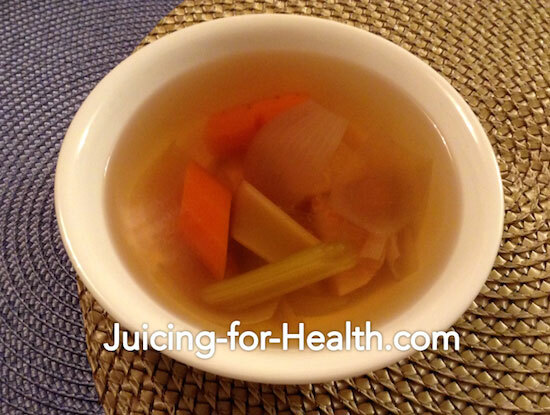 This kidney-cleansing vegetable broth is a modified version of the Hippocrates soup. The main ingredient in this broth is celeriac. Celeriac (a.k.a. 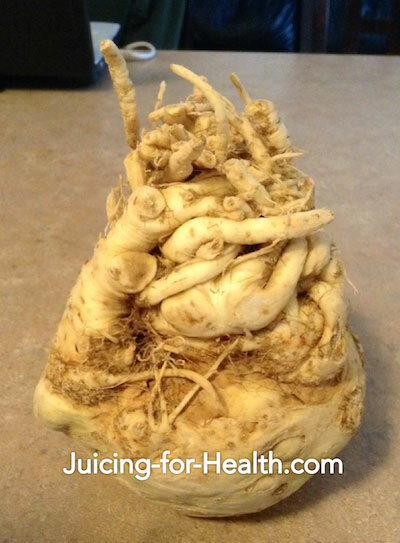 celery root) is a winter root vegetable and many people have not seen it, let alone try it. If you can find this at your local market, definitely have a go at it. The taste is almost bland, a cross between potato and jicama with the texture of a beetroot. Celeriac is a nutrient-dense root vegetable that is very healing for the digestive system. Due to its excellent analgesic and antiseptic properties, celeriac is antibacterial, antifungal and can be used therapeutically for healing of digestive disorders including peptic ulcers, gastritis, indigestion and constipation. 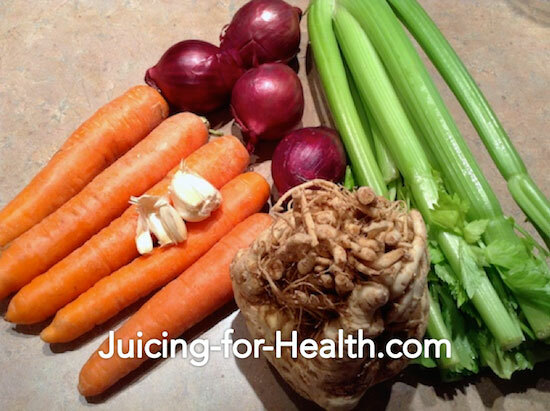 As with most root vegetable, celery root juice can be very healing for the internal organs especially liver and kidneys and help boost the immune system. Read more on how you can do a complete kidney detox or a liver detox. 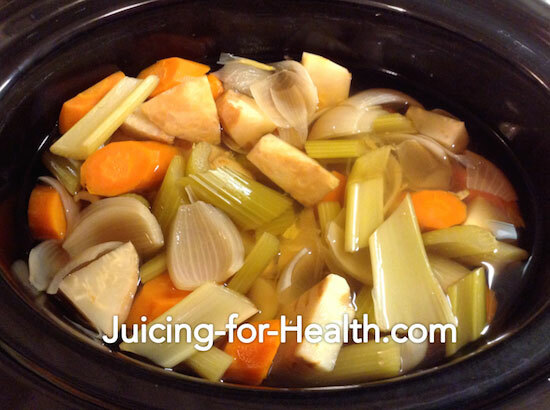 To make this broth I use a crock pot (slow cooker) as it is not only easy and economical, it also retains all the nutrients and flavors from the vegetables. If you don’t have a crock pot, you may also cook over the stove. The method will be very similar to when cooking using a slow cooker. Many people ask me if nutrients do get lost when cooked in high heat. The short answer is yes, and no. Vitamins are more delicate and get destroyed when exposed to heat. 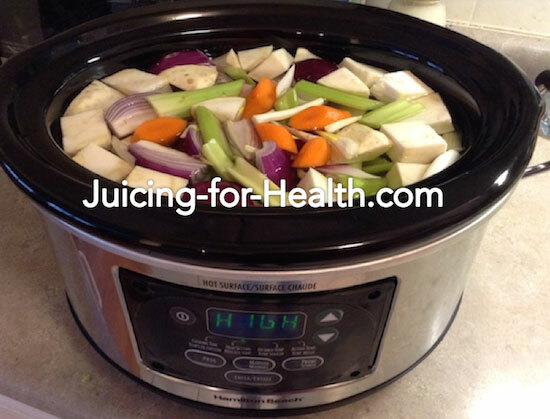 However, when cooked over slow fire or in a crock pot, the phytonutrients and other minerals from the vegetables get “leached” into the broth, making the broth highly nutritious. 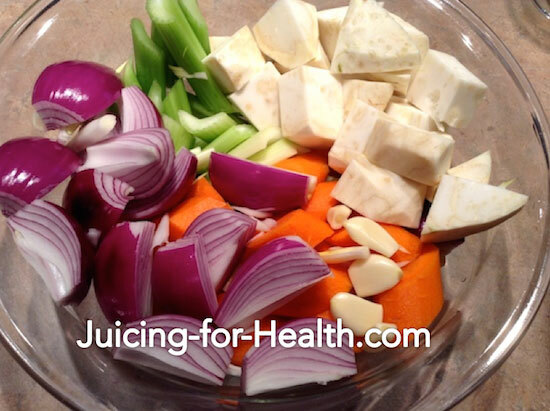 Drinking broth is beneficial when you are juice fasting and want to drink something hot and nutritious. Hot broth gives your body warm energy as opposed to cold juice. This is also a great idea to benefit from most of the vegetable phytonutrients, if you live in a cold place and have need for something hot to keep warm. This portion serves four. You may substitute these ingredients with other “hardy” vegetables that you fancy. Note: Use smaller quantities if you are cooking in a small pot. I always make more and store the balance in the fridge for later. Fill your broth pot or crock pot with 2 quarts/liters of water to boil over high heat. While waiting, wash and scrub the vegetables well with a vegetable brush. Cut them up into small cubes. Put all your cut vegetables into the boiling water. In a crock pot, I put it on high heat yet it doesn’t dry out the water. If you are cooking over the stove, you will have to put it on lower heat, have the lid on and check every now and then to be sure it doesn’t boil over or dry up. I put the slow cooker to cook on high for about six hours, until all the vegetables turned soft. Once cooked, you may like to run the cooked vegetables through a food mill/processor. A gear juicer works well for this function, using the “mincing” screen. Otherwise, use a blender and blend till you get a smooth consistency. Do this while the soup is warm, NOT when it’s hot or cold. Then add the pulp back into the broth and drink as a thick soup. I like mine just as it is — clear broth. When juice fasting I don’t eat the soft vegetables. Let the soup cool before storing. Keep in air-tight container in the refrigerator and consume in no more than 48 hours. To reheat, simmer over stove, do not use microwave oven. Hi Connie, yes, of course vegetable stock sounds like a great idea, as long as you’ve boiled it yourself, and not from a stock bouillon. Enjoy!